Specialising in Korean-style fried chicken, the chain was first established in 2009 and has 13 stores across Singapore, Malaysia and Indonesia. 4Fingers will open its first Australian store in the Melbourne CBD on 14 June 2017, followed by a Chermside store opening 22 June 2017 and a Brisbane CBD store operating from 7 July 2017. 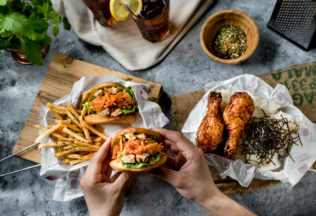 4Fingers uses free-range chicken and offers twists on traditional fast food chicken offerings, serving kimchi coleslaw and other Asian-inspired menu items. Chief Executive Officer of 4Fingers, Steen Puggaard, said 4Fingers has its sights set on the United States and Europe after entering Australia. “Apart from great chicken, quality and experience, we are focused on building a strong brand,” Puggard said. “Our store designs, uniforms and even the kind of music we play reflect that. We are about casual dining, not fast food,” he said.